It turns out that, when given the time, I am the worst postcard procrastinator! It takes me a week (or month) to buy a postcard, three weeks to write it, another week to find the address of the recipient and now there’s a countdown for how many days a postcard will ride around in my purse until I buy stamps. Ever find there are some tasks you just put off forever? I am weirdly on top of unpleasant tasks like toilet cleaning and sweater hand-washing (so tedious), but postcard writing? Lots of dragging of feet on that one. I don’t understand me, because card sending I like! I have a cupboard full of pretty note cards and they are often actually sent to an unsuspecting loved one (who doesn’t love mail that isn’t a bill, right?). 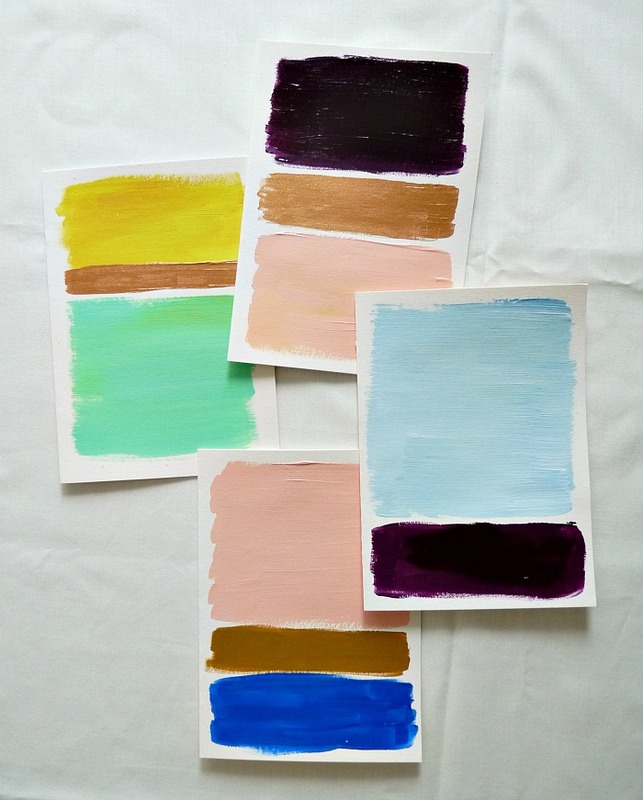 I even made some cards, when I painted my Rothko-inspired paintings. high time to do something with them. few irregular rectangles and, ta da, personalized note cards. I let them dry for a few days before adding them to my note card stockpile, just to be sure they wouldn’t stick to the inside of the envelope or each other. 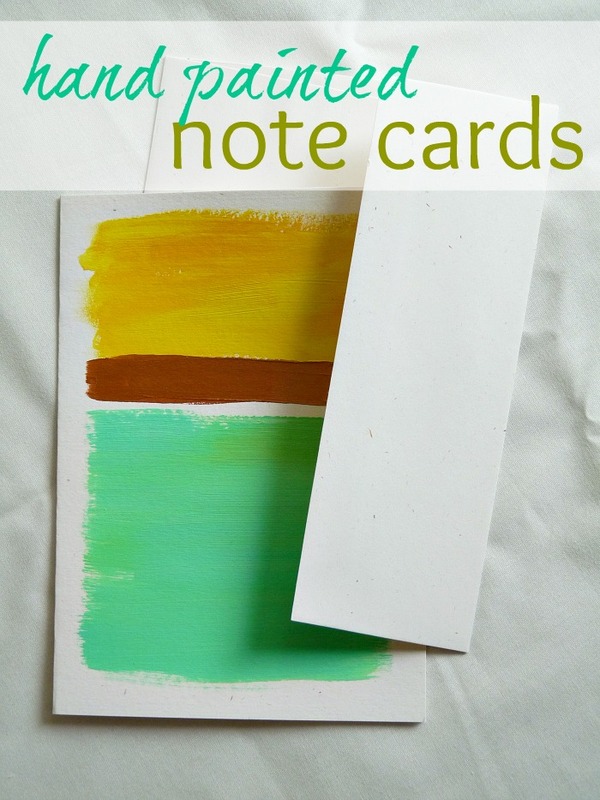 I love the idea of personalized, hand painted note cards. You could paint and give a set of these as a gift, or attach one to a present (with maybe a dash of matching paint on the envelope too?). 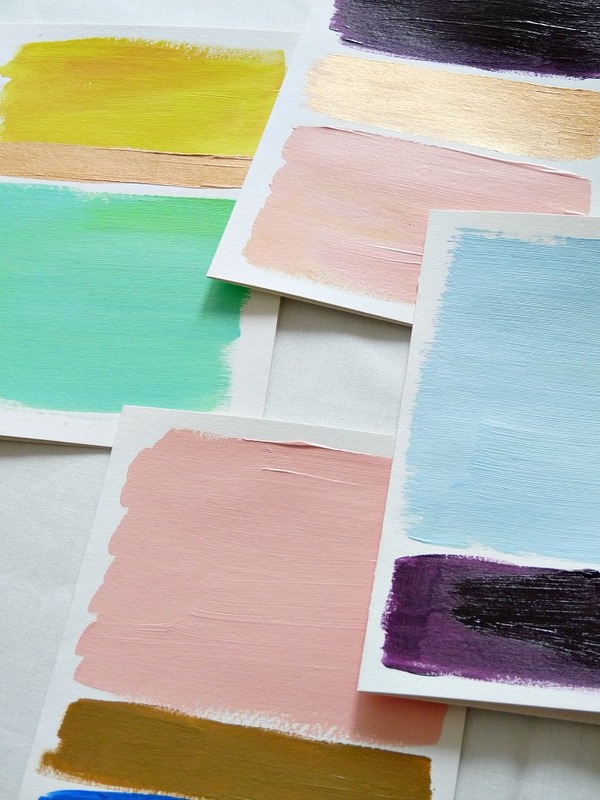 Picking colours that complement the wrapping paper or gift bag would look so chic, and so thoughtful. I also think painting cards in berry hues and crisp greens would be a fun, fresh take on holiday cards. Or forget the presents and holidays, and just send one to someone who needs a little pick me up. 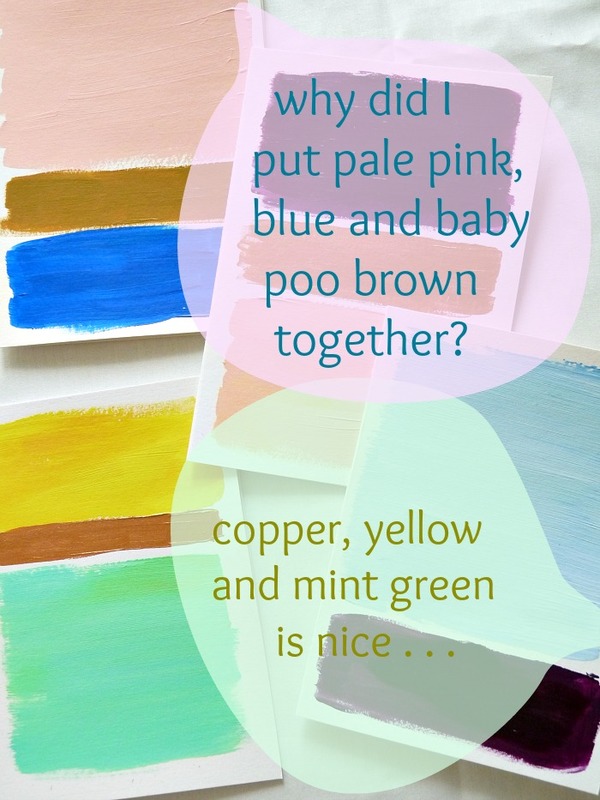 Think a little about the colour palette, though. Baby poo brown might not be the heartfelt “thinking of you,” message I was hoping to send. Just don’t wait for one of these hand painted cards from me because I might be weeks away from finding a post office . . .
Next Post A Weird Blog Happening, But Good Karma? Love this idea for gifts. I have a whole rubbermaid tote just filled with paint and this is the perfect craft for them! Also, Michaels often has great sales on heavy cards/envelopes that I think would work well for this DIY. I posted a photo and link back to your blog on my Tumblr Holiday Crafts Blog. Awww, thanks for the link love! Good to know Michael's has these kinds of blank cards. I figured any craft store worth their salt should. Great minds think alike! I'm in the middle of a hand made note card project myself!